Cryoscope Lets You Feel Tomorrow's Weather | OhGizmo! By David Ponce on 02/06/12 • Leave a comment! Weather forecasting, inaccurate as it might sometimes seem, is still a pretty useful science. But at the end of the day, you’re only told what tomorrow’s temperature is going to be. No one is actually, you know, showing you. That might be the line of thought that made one Robb Godshaw create the above Cryoscope. It’s a device that lets you feel, with your hand (or any body part you wish to use…), just what tomorrow’s temperature will feel like. 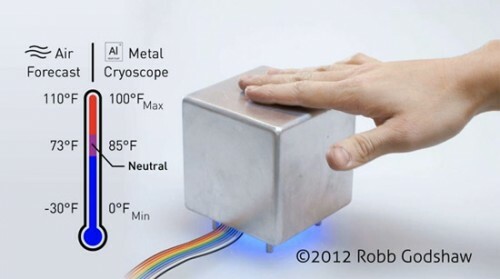 It consists of an aluminum cube which contains a heat sink, a fan and a Peltier element, which is a thermoelectric pump. An Arduino brain fetches tomorrows forecast based on your previously entered zip code, and the device automatically adjusts its external temperature from 0F (really freaking cold!) to 100F (tropical heat). Anything outside those boundaries should serve as a reminder that moving to a place with better weather should be on your to-do list. It doesn’t look like you can buy this thing, but we could be wrong.